I first got turned on to Bonnie Raitt through her 1972 LP Give It Up (although it was the late 70s before I discovered it). “Too Long At The Fair” is an amazing song and Bonnie’s interpretation is perfect. Bonnie has had a great career as a singer, songwriter and instrumentalist (slide guitar). She had a moderate following and no real hits the first 20 years of her career, but then she hit gold and hit a grand slam in 1989 with Nick Of Time. She has figured out how to make a gumbo of blues, soul, funk, country, Americana and Southern California singer-songwriter without sounding schizophrenic. Since Nick Of Time Bonnie has consistently delivered quality albums and she has moved from an interpreter during the first half of her career to a solid singer-songwriter for about half of her material in the second half. At 66 and 17 albums she is still consistently delivering quality material. The album opens with the self-penned “Unintended Consequences Of Love” which is built on a solid funk foundation (think Stevie Wonder) and Bonnie’s bluesy singing. If you play it quietly it sounds nice but if you play it loud you really feel the nasty groove – so you could play this at a dinner party or at a dance party. I love it when music is nastier than it first seems. Bonnie takes an INXS song, “Need You Tonight,” steps the pop sheen, slows it down, yet retains the funk – making it all hers. “I Knew” has a nice slow Stone’s groove (think solo Keith Richards). The song includes a nice Bonnie slide solo. Bonnie slows it down with “All Alone With Something To Say.” This is a classic Bonnie ballad that would not have sound out-of-place on Nick Of Time. Lots of dripping slide to keep a sentimental song from sounding to sappy. The party is back on with “What You’re Doin’ To Me” a nice honky-tonk rock and roll song. “Shakin’ Shakin” Shakes” is a Los Lobos song with a Bo Diddly beat on amphetamines. Bonnie plays is pretty faithful to the original. “Undone” is a sad ballad that lets Bonnie show off her gorgeous vocal pipes. “If You Need Somebody” is a Bonnie original in classic Southern California singer songwriter style – this could easily be a Jackson Browne song. “Gypsy In Me” is a nice guitar groove. “The Comin’ Around Is Going Through” opens with a cleaned up Black Keys groove and rides on with almost a ZZ Top groove. This is another Bonnie original. Bonnie is in a scolding mood and is wagging her finger. If you want to ignore the politics, then just ride the ripping guitars. One of my favorite singer songwriters is Joe Henry (he produced Bonnie’s last album). His “You’ve Changed My Mind” is a perfect Bonnie ballad. This song is augmented by the great guitar duo of Bill Frisell and Greg Leisz (see my Lucinda Williams review). “The Ones We Couldn’t Be” ends the album on contemplative note – a gorgeous weeper filled with sweet regret. 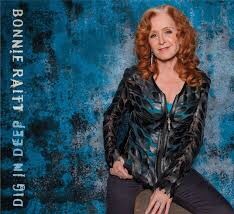 Bonnie keeps putting out great albums 40 plus years into her career. She remains hip without pandering. Her last album, Slipstream, was a great album and I would have been satisfied if that was it, but Bonnie is not done working and duplicated it. If you are a fan you will not be disappointed. If you are not familiar with Bonnie this will be a great introduction.